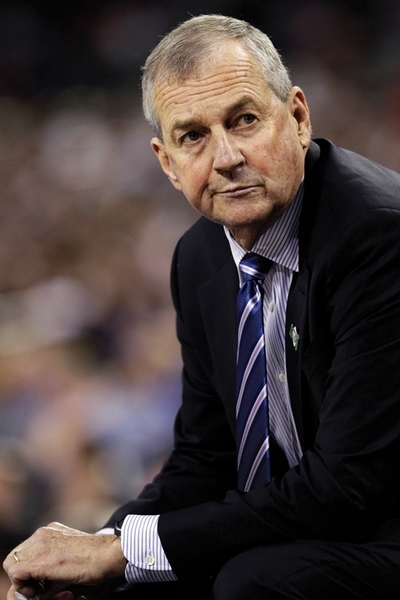 NEW YORK – Jim Calhoun has spent more than half his life as a head basketball coach, never venturing far from the New England area where he was born. Between coaching stints at Northeastern and Connecticut, he racked up 873 wins – 625 of them coming at his beloved UConn, where he ran the men’s program for 26 years and won three national titles. Recently, though, the 70-year-old Hall of Famer has struggled with health problems, including a fractured hip last month that put him on crutches. On Thursday, he planned to announce his retirement, a person familiar with the decision told The Associated Press. The person spoke to the AP on condition of anonymity because Calhoun’s move had not yet been made public. WVIT-TV in Hartford first reported the expected announcement. Ollie will take over a Huskies team that is ineligible for the 2013 NCAA tournament because of its failure to meet national academic standards, one of several off-court problems that hit UConn late in Calhoun’s tenure. The Huskies will open this year with just five players who saw significant playing time last season. Before fracturing his hip, Calhoun fought off cancer three times and missed eight games last season while suffering from a painful spinal condition. He returned just four days after having back surgery to coach the Huskies in their regular-season finale and the postseason. UConn finished the year 20-14, losing to Iowa State in the first-round of the NCAA tournament. In addition to his medical leave, Calhoun served a three-game suspension at the start of the Big East season last winter for failing to maintain an atmosphere of compliance in his program with NCAA rules, an issued that dated back to recruiting violations in 2008. A native of Braintree, Mass., Calhoun played college basketball at American International in Springfield, where he was a team captain and leading scorer his junior and senior years. After graduating in 1968, he began his head coaching career at Old Lyme High school, before moving back to Massachusetts where he coached at Westport High School and then Dedham High School. He led Dedham to a 21-1 record in 1972, and was hired as head coach at Northeastern. Calhoun spent the next 14 years at the school, leading the team from Division II program, to a mid-major power with five appearances in the NCAA tournament. Calhoun was then hired by UConn in May 1986 and won an NIT title in his second season. His teams won 10 Big East regular-season championships and seven Big East Tournament titles over his tenure. In 1999, he coached the Huskies to a 34-2 record and their first NCAA championship, a 77-74 upset over Duke. In 2004, the Huskies started and ended the season at No. 1, beating Georgia Tech in the NCAA championship game 82-73. The Huskies, led by Emeka Okafor and Ben Gordon, won their six tournament games by an average of over 17 points. In 2011, UConn finished the regular season in ninth place in the Big East before reeling off a remarkable 11-consecutive wins during the postseason, including a 53-41 victory over Butler in the national championship game. Calhoun’s only loss in the Final Four came in 2009 to Michigan State in the national semifinals. The coach missed the Huskies’ first NCAA tournament game that season after being hospitalized for dehydration. It was one of several health issues that marked his time at UConn, where he missed 29 games, and left another 11 because of illness. He successfully battled prostate cancer in 2003 and skin cancer twice, most recently in 2008. Calhoun took his latest medical leave on Feb. 3 and missed eight games because of the effects of spinal stenosis, a narrowing of the spine normally associated with aging and sometimes with arthritis. It began affecting him in the summer of 2011, but reached the point where he could no longer coach after the team lost at Georgetown on Feb. 1. He underwent a two-hour surgery on Feb. 27 in New York that involved removing a large disk fragment that had been pressing on a spinal nerve, the school said. The surgeons decompressed the area around the nerve. He returned in time to coach UConn to a regular-season ending win in Pittsburgh and two victories in the conference tournament, before the Huskies lost in the Big East quarterfinals to Syracuse, and in the first-round of the NCAA tournament to Iowa State. Last month, Calhoun had surgery to repair a left hip fracture from a bicycle accident. He was cycling near his summer home in Madison when he hit sand and fell, hours before he was to coach former players in a charity game. Calhoun also was hospitalized in 2009 after breaking several ribs during a charity bike ride and he missed seven games in the 2009-210 season for an undisclosed stress-related medical reason. In May 2010, the program was cited by the NCAA for eight major rules violations. The allegations came at the end of a 15-month investigation into the recruiting of former player Nate Miles, who was expelled from UConn in October 2008 without ever playing a game for the Huskies. Besides accusations that his staff improperly contacted recruits, gave them improper benefits and distributed free tickets to high school coaches and others, Calhoun was cited for failing to maintain an atmosphere of compliance. The accusations led to the resignations of two assistants, and a promise from Calhoun to make things right. He told reporters that the idea of bringing closure to that issue was a “major, major factor” in his decision to come back after the 2011 championship season. Calhoun also faced criticism for his team’s performance in the classroom. His team failed to qualify academically for the 2013 NCAA tournament under rules passed in the fall of 2011. UConn sought a waiver citing improved scores in 2011-12, but that was rejected and five underclassmen left the Huskies after last season. Sophomore guard Jeremy Lamb and freshman center Andre Drummond departed for the NBA, a move both were expected to make even if UConn had been eligible for the tournament. Alex Oriakhi transferred to Missouri for his senior season, citing the NCAA decision. Sophomore forward Roscoe Smith transferred to UNLV and redshirt freshman center Michael Bradley left for Western Kentucky. Ollie, Calhoun’s expected successor, played at UConn and spent 13 seasons in the NBA, before being hired as an assistant in 2010. He has long been mentioned as a logical successor, and has said he would want the job. Calhoun is well known for his support of many charities, and has raised millions to help build the Pat and Jim Calhoun Cardiology Center at UConn Health Center. He also is the state’s highest paid employee, signing five-year, $13 million contract in 2010. Associated Press writer Pat Eaton-Robb in Hartford, Conn., contributed to this report.